Recently, I was searching for a blow up mattress and stumbled upon the Embark twin vinyl airbed. The bed was low cost, but seemed relatively easy to use. The bed may have a short lifespan, but for those who want something convenient and inexpensive this is the bed to choose. The biggest differentiator for me was the price. I was looking for something short term. I knew if the bed broke in the first night, I could still bring it back for a refund. Knowing this, I thought it was worth a try. I bought the mattress at Target. It was the least expensive costing $14.69. 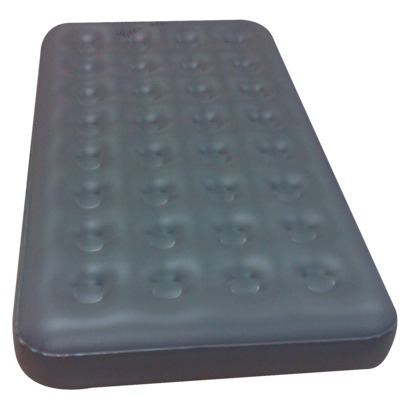 The next price up for a twin air mattress was $34.99. This was for the Intex Twin Pillowrest Single High Air Mattress. However, this bed also includes a built in pump. I didn’t want to blow the mattress up myself, so I had to purchase a separate pump as well. 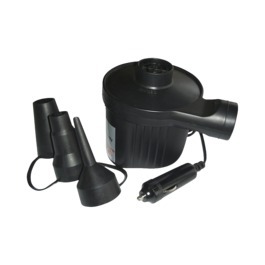 I bought the Embark 12V Vehicle Pump for $15.49. This totaled one bed to equal $30.18. The ending price was still cheaper than the next price up bed, but there is also the option of self inflating, and not having to purchase a pump. For my purposes, I had to buy two beds, so this option saved me a bit more money. The pump can be used for other items besides the bed. This is not possible with a built in pump. So, there are multiple cost options depending on personal preference. The instructions state that the bed will deflate a little for the first couple nights. This is because the plastic stretches out when it is initially filled up. After the first night the bed did sink in a little, but it was not very prominent. I used it for a few weeks and never needed to refill it. If the bed doesn’t get a leak, then it will last a long time. Leaks are hard to fix on the bed. The other bed I bought did get a leak. First, it is hard to find. The only way to find the leak is by submerging the bed, obviously not do-able, or, by feeling for leaking air. This is time consuming. Also, if there is more than one leak, you have to repeat the procedure. Second, the fix patches don’t always work. For one leak, I placed the patch on the hole and waited 15-20 minutes before using, as is stated in the instructions. However, it still leaked when I tried to use it. They do work great as long as they don’t get damaged. The Embark twin vinyl bed is for those who want an inexpensive, short term, air bed. I would buy it again if I needed to get one. However, it is important to keep them away from anything that could puncture, or otherwise damage the bed. They are hard to fix after they get a leak. Otherwise, they can last a long time, and with proper bedding, can be used to get a good nights sleep. If the bed does end up punctured, here are some helpful tips to fix the leak.